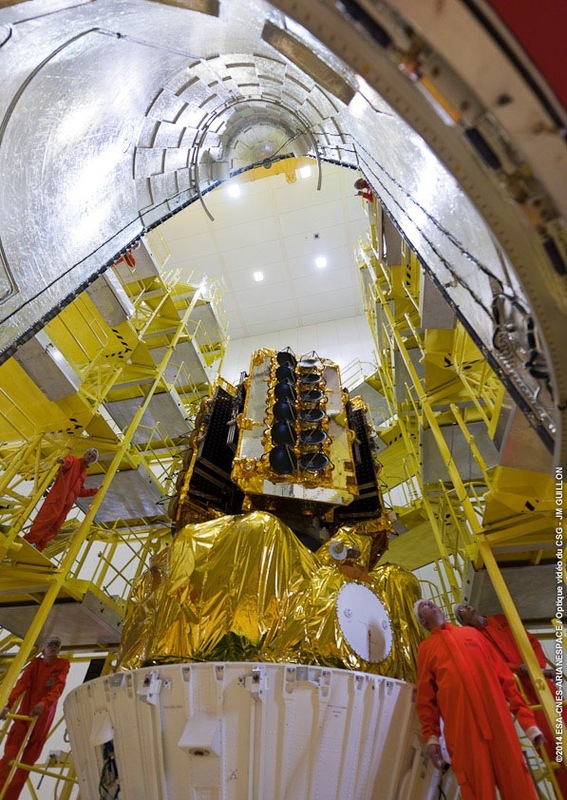 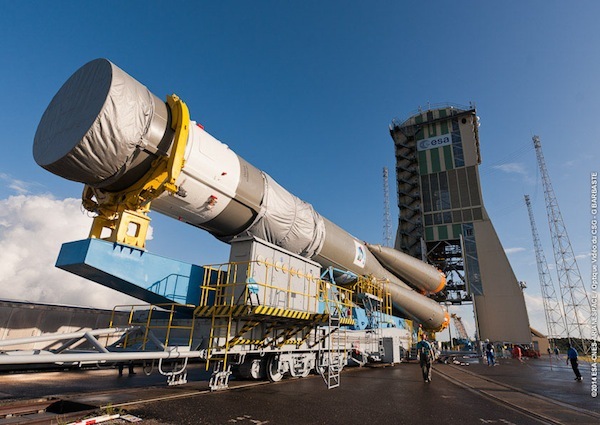 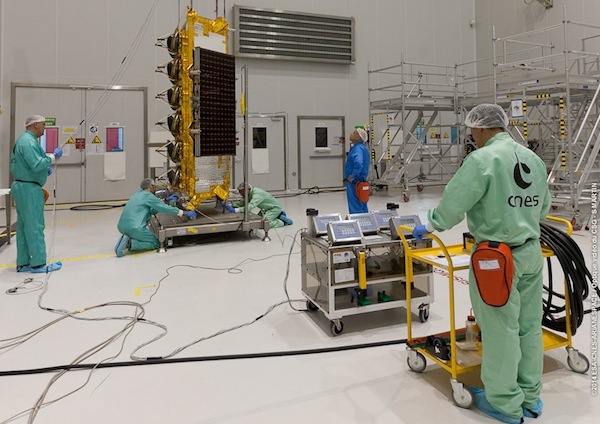 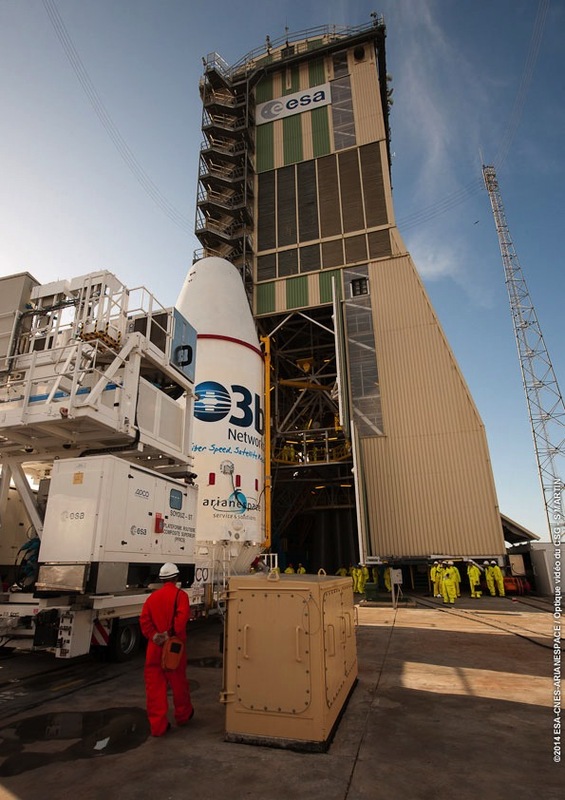 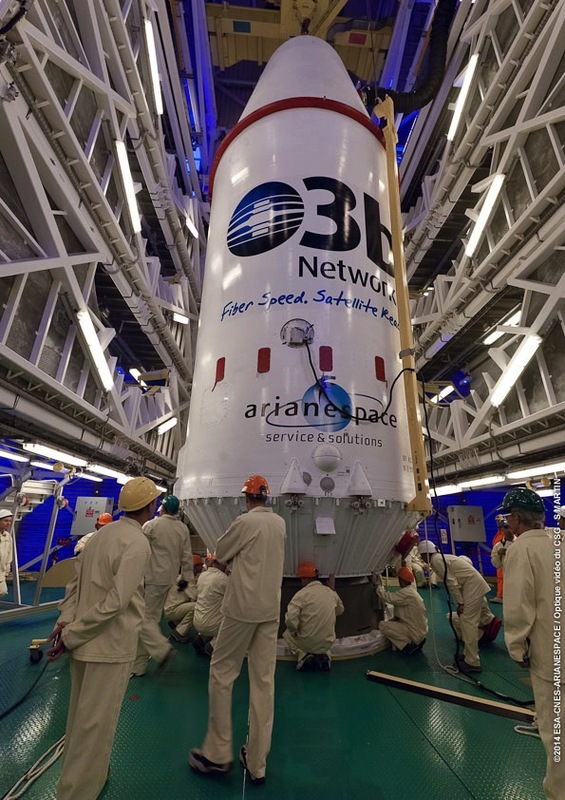 Four broadband communications satellites for O3b Networks are set for launch Thursday on a Soyuz rocket from the European-run spaceport in French Guiana. 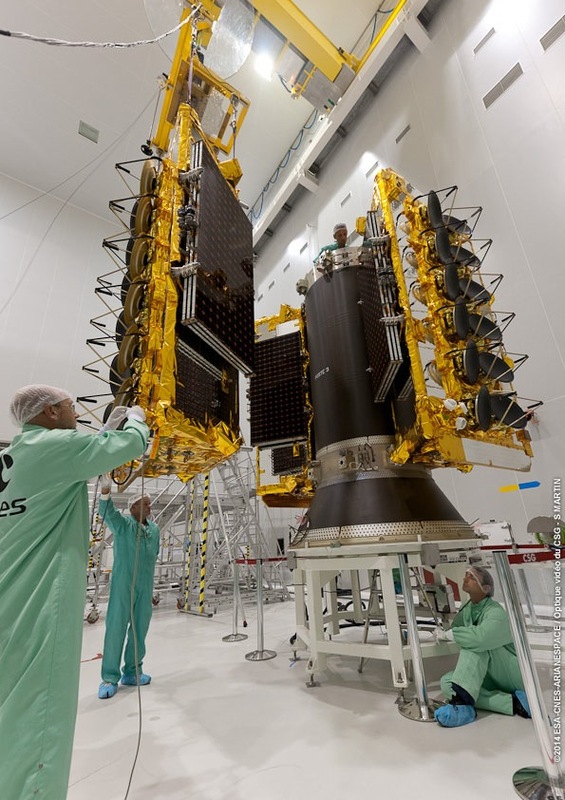 The spacecraft, built by Thales Alenia Space of Italy, will beam high-speed Internet to customers in the developing world. 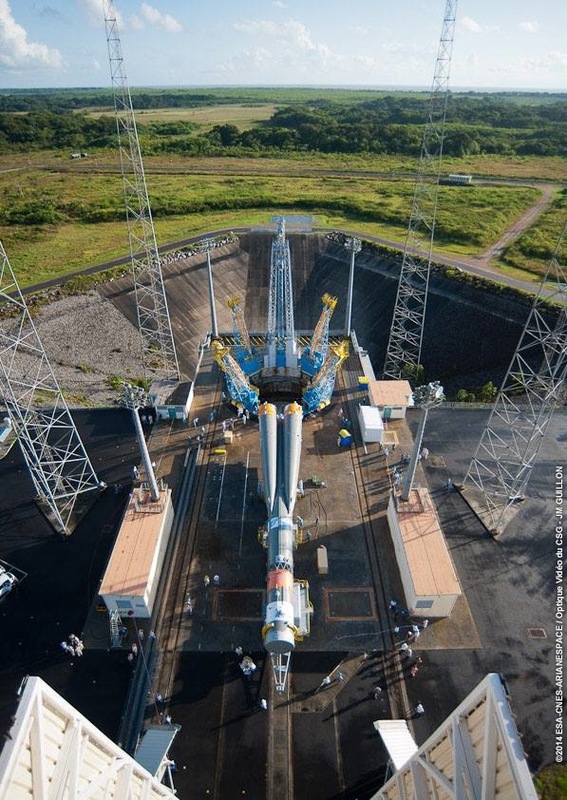 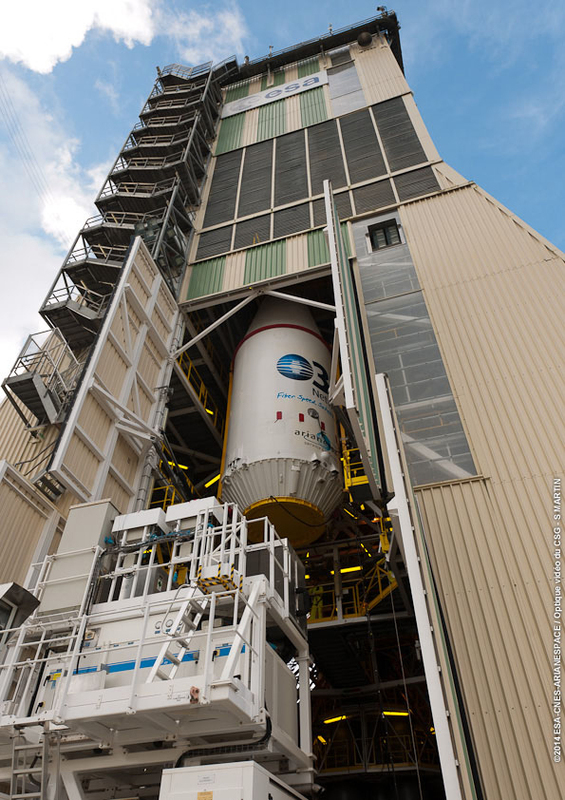 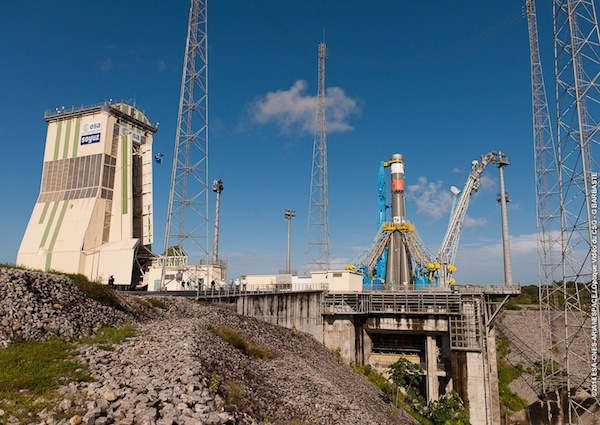 Liftoff is set for 1855:56 GMT (2:55:56 p.m. EDT) from the Soyuz launch pad at the Guiana Space Center, home of the Ariane 5, Soyuz and Vega launchers. 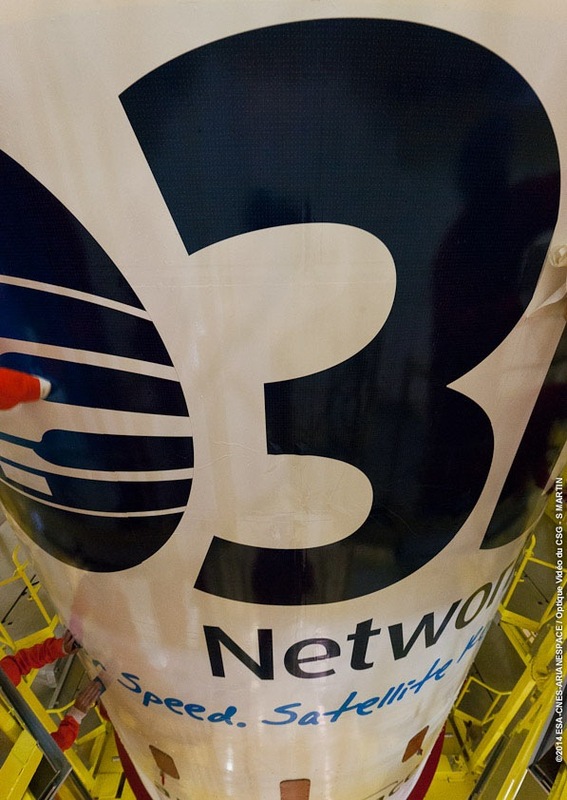 O3b customers include maritime users, companies in the oil and gas exploration industry and government-controlled operators. 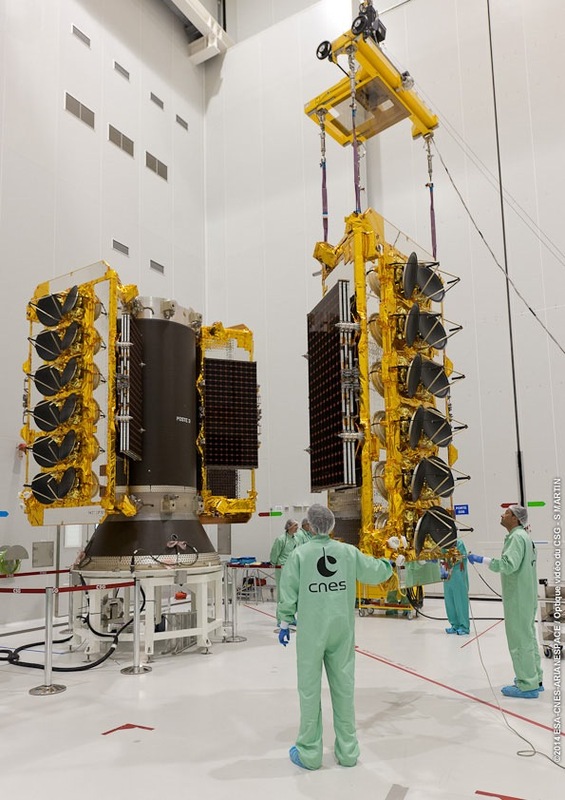 With an operational orbit about 5,000 miles over the equator, the satellites will reach customers between 45 degrees north and 45 degrees south latitude. 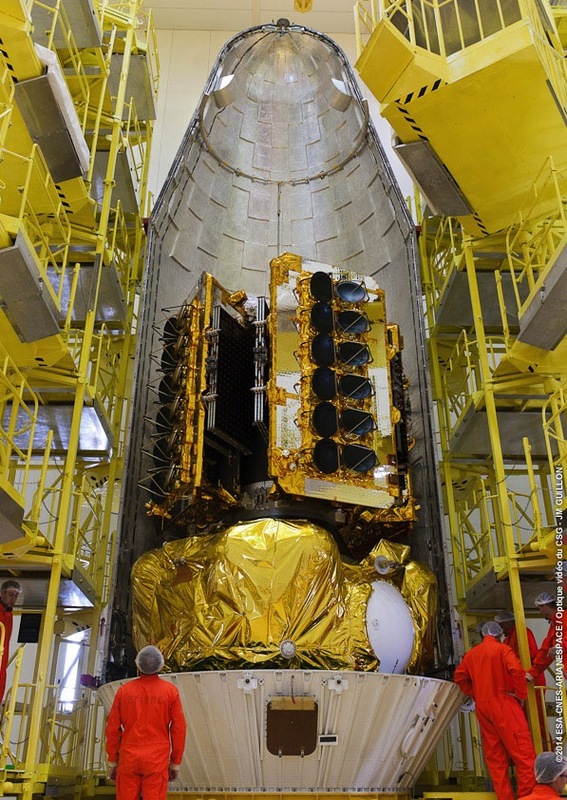 Each satellite is about the size of a car and weighs 700 kilograms, or about 1,543 pounds, at liftoff. 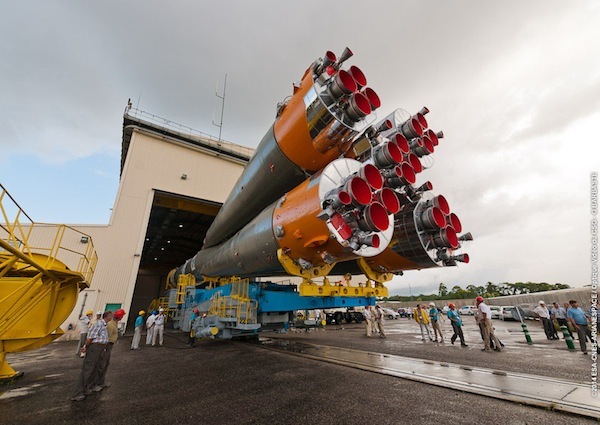 Thursday's launch will mark the eighth Soyuz mission to take off from French Guiana since October 2011. 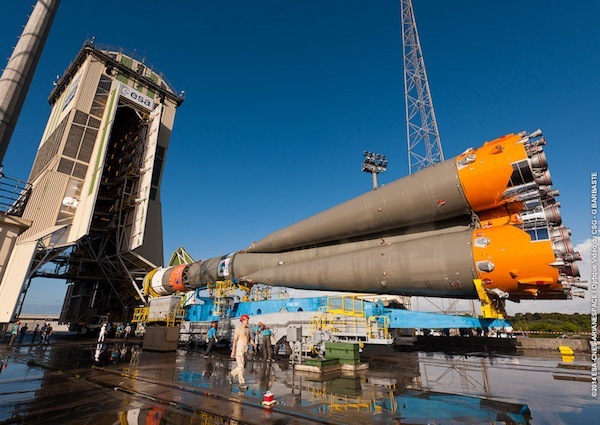 The spacecraft was attached to the Soyuz rocket Monday evening after the three-stage rocket rolled to the launch pad from its integration building earlier in the day. 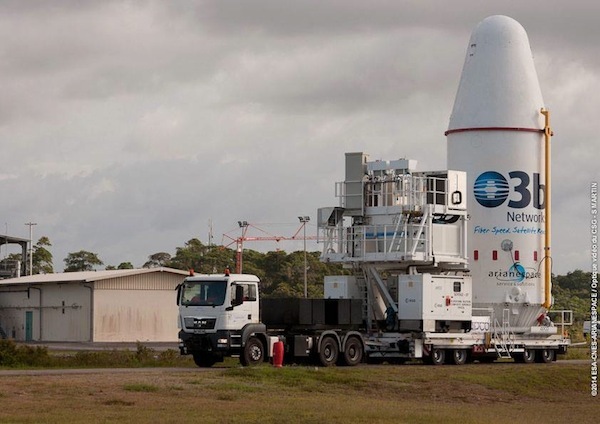 The rollout operations began Monday just after sunrise. 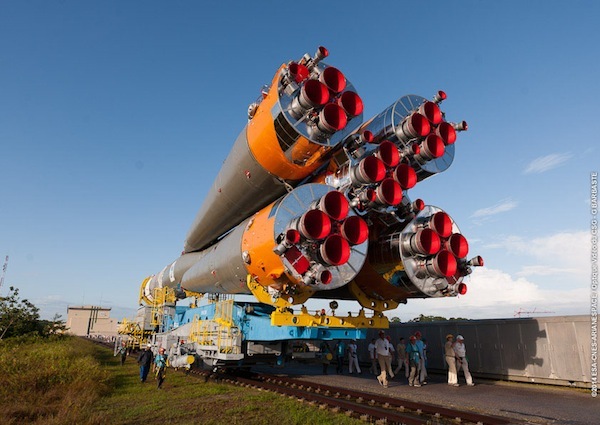 Russian workers moved the three-stage rocket on a specialized transporter-erector system riding on rail tracks. 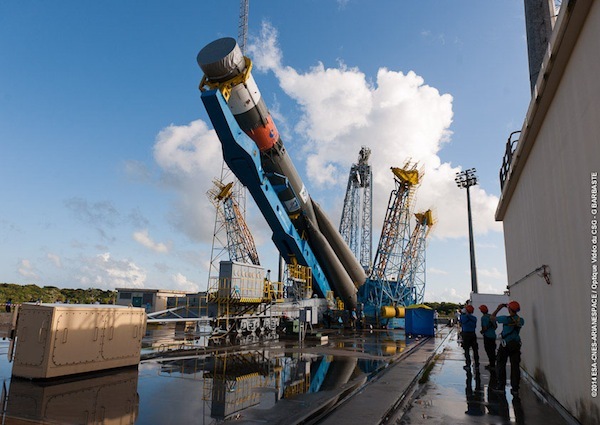 By midday, the Soyuz was lifted vertical over the launch pad's cavernous flame trench carved out of granite bedrock. 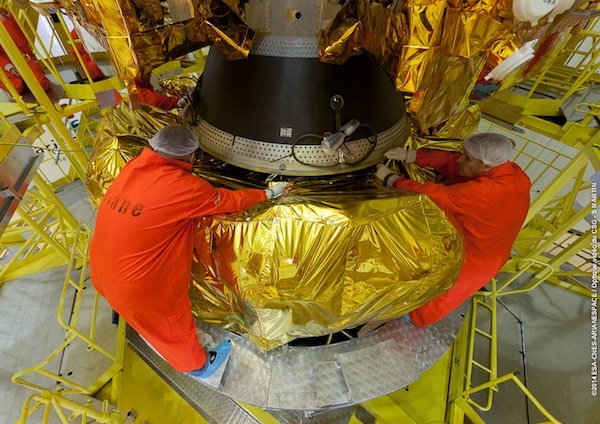 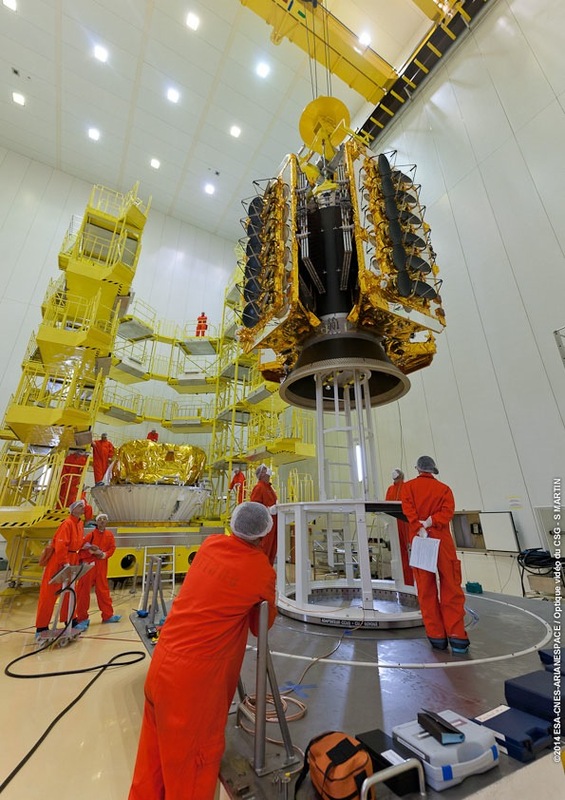 The photos below chronicle preparations of the O3b satellites, including their attachment to a dispenser before encapsulation inside the Soyuz rocket's 13.4-foot diameter payload fairing atop the launcher's Fregat upper stage. 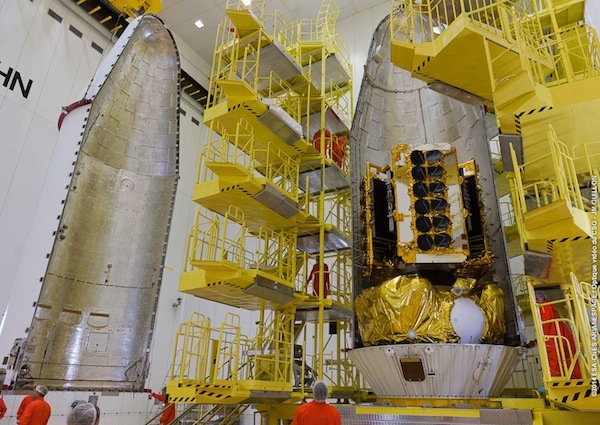 The gallery also shows rollout of the Soyuz rocket and the transfer of the O3b satellites and Fregat upper stage to the launch pad.